I think pizza margherita is the true test of a pizza joint. If they can get this right, they can get anything right. It’s what I order every time I visit a new pizza restaurant. There is real beauty in the simplicity of pizza margherita. Delicate almost. Simple flavours that come together to make something surprising. Something unexpectedly good. After all, there’s nothing to pizza margherita. It’s a cheese pizza. Like you feed little kids. That’s why I love it. To make something so seemingly uninteresting absolutely delicious. That’s just magic. At the base, the dough has to be great. Bland dough equals bland pizza margherita. No way around it. 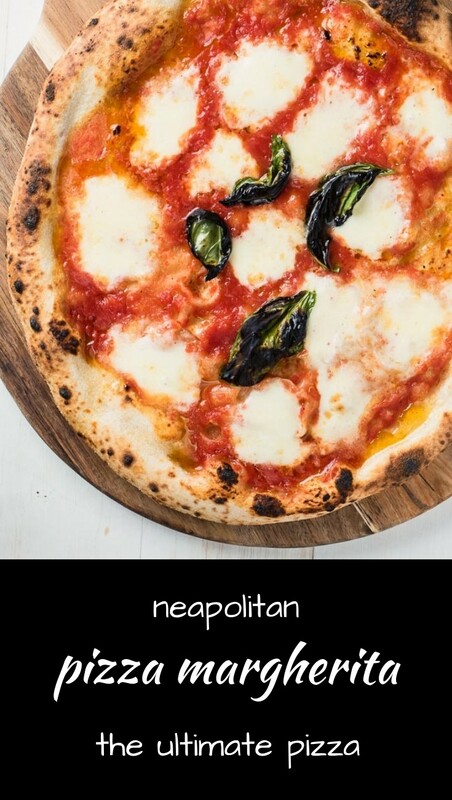 Neapolitan pizza dough only has 4 ingredients. Flour, salt, yeast and water. That’s it. So it’s important to learn how to make it. It’s a bit of a journey to master but it is absolutely worth it. Figure that out and you will be able to make better pizza than you can buy. 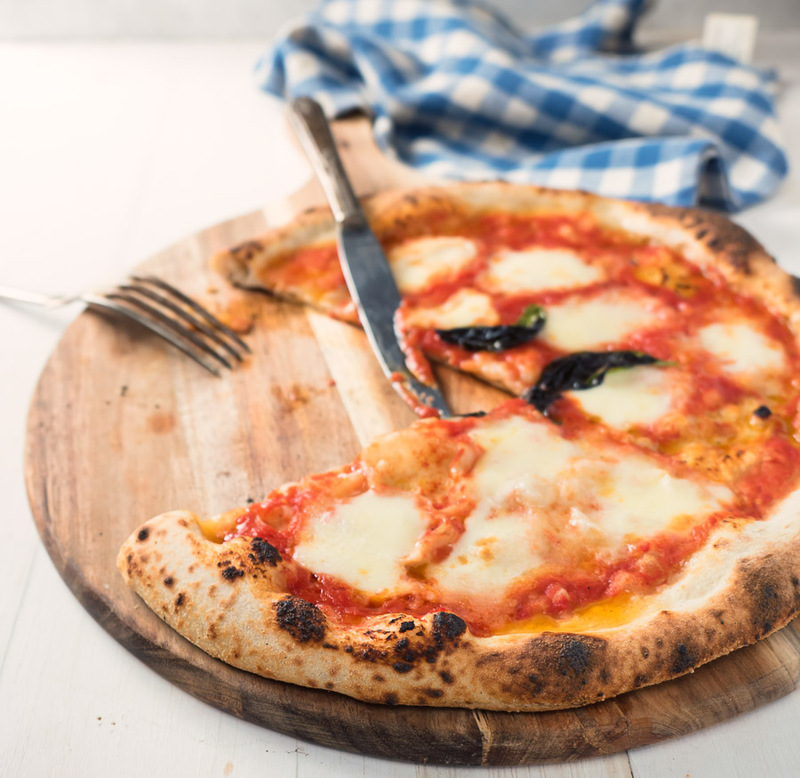 Neapolitan pizza sauce is also simple. Pure tomato flavour. Only two ingredients. San Marzano tomatoes and salt. For real. Nothing more. Not cooked. 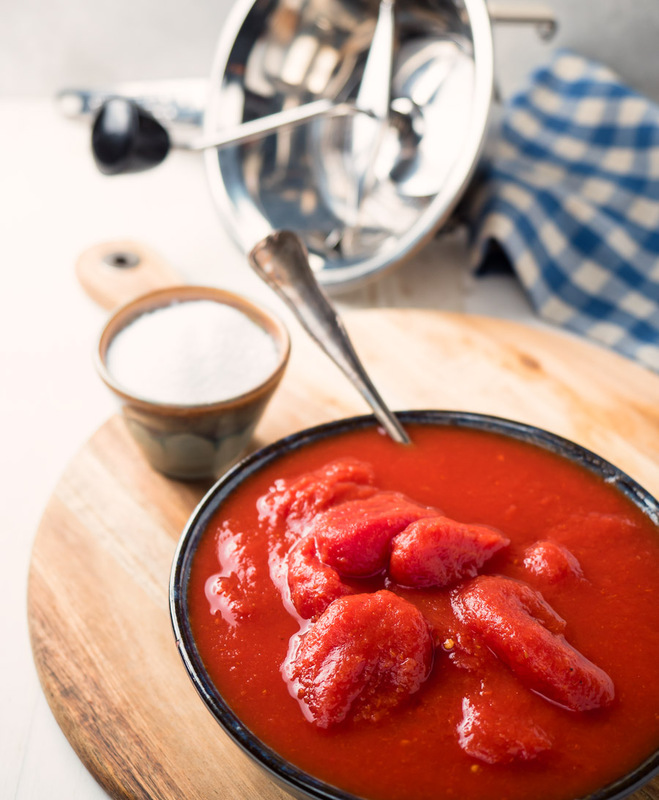 Just put a can of San Marzano tomatoes through a food mill. Add a teaspoon of kosher salt. Stir. That’s it. Done. Delicious. Try it. You will be converted. Hard to believe but true. Less is definitely more here. Fresh mozzarella is key to pizza margherita. Neapolitan pizza in general. For the ultimate experience seek out the real stuff. It’s made with buffalo milk. Expensive though. And not so easy to find. Fior di latte is a good substitute. It’s made with cow’s milk. A lot cheaper. And easier to find. I use it pretty regularly. People don’t seem to mind. There are lots of great pizzas you can make with dry mozzarella. The stuff that comes in bricks. But pizza margarita isn’t one of them. Just don’t do it. A few things to keep in mind. Neapolitan pizza isn’t baked in a kitchen oven. It’s fired at high temperatures. 750F-900F. To make this you will need an oven that goes high. Hot. A pizza oven. There are lots of reasonably low cost options out there. Open your dough. Do it by hand. Don’t roll it. That pushes the air out of the edges. The cornice. Makes for a flat pizza. Dress it on the counter. Flour your peel. Pull the pizza onto the peel. Take a second to reshape your pizza. Now move quickly. Get to your oven. The longer you wait the more likely your pizza is to stick to the paddle. And that’s a disaster waiting to happen. This is the hardest part. The moment of truth. If you jiggle your pizza off the peel it will contract. Shrink. And that makes the dough thicker than you want. Harder to cook through. The launch took me a while to get down. It’s a leap of faith. You need to believe you won’t destroy your pizza. And the worst part is you will probably destroy the first couple you try. I did. It’s not easy. A beer or two before you launch your first pizza isn’t a bad idea. Loosen up a bit. You want to slide the pizza off quickly. It’s a push forward and a snap back. Slower going forward. Fast coming back. It takes some getting used to. Getting brave enough to go for it. It’s a fine example of no guts, no glory. Best bet is to watch a few videos and then practice. You will get it if you try hard enough. 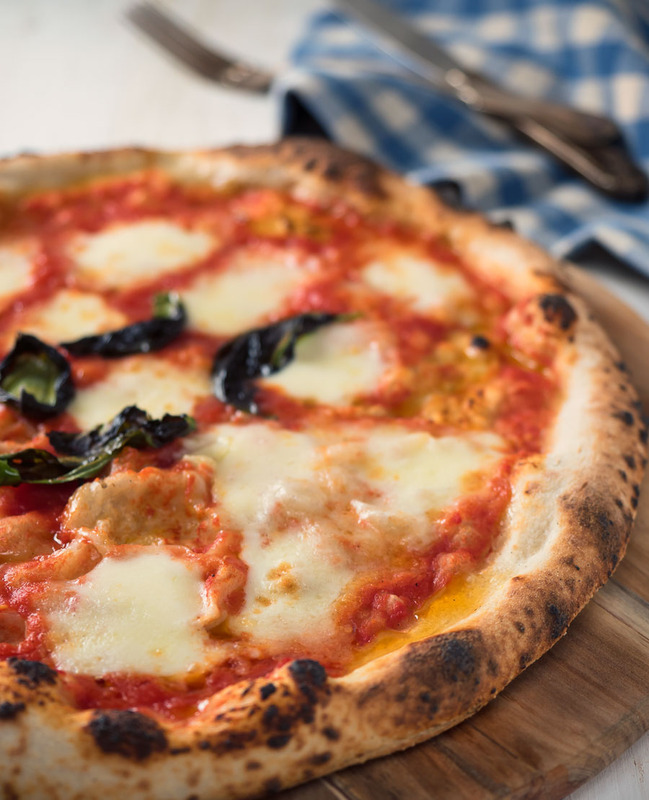 Neapolitan pizzas cook in about 90 seconds. Two minutes on the outside. 750F is hot. 900F is crazy hot. Check your temperature before you launch. Learn what temperature works for your oven. Launch your pizza and watch it closely. Turn it as needed. You are watching the edge of the pizza. When it starts to brown and blister evenly the pizza is done. Any longer and it will burn. Pizza margherita requires top notch ingredients and technique. It's simple and pure. And there's nowhere to hide. Preheat your pizza oven. Actual temperature depends on the nature of the oven you are using. I can't tell you what temperature works best for your oven. You have to figure that out. Between 700-800F is a good starting point. While your oven heats up, coarsely pull apart your fresh mozzarella. You want pieces about the size of a grape. Put the cheese on paper towel and cover with more paper towel. You are trying to dry it out a bit. Put about 4 tablespoons of sauce on the pizza dough. Spread it around. Use two spoons here. If you use the same spoon you will cross contaminate your sauce. And it will go off faster. Trust me. I've made this mistake more than once. Place the mozzarella on the pizza. You are looking for a roughly even distribution. Sprinkle a bit of parmigiano overtop. Add 3-4 basil leaves and drizzle with olive oil. Flour your peel. Pull the pizza gently onto the peel. Reshape your pizza to try to get it roughly round. Launch your pizza. Be brave. Don't try to jiggle it off the paddle. That makes the dough contract. Makes the pizza shrink. You want to be assertive. You may fail the first few times but you will get it. Depending on temperature your pizza will cook in 90 seconds to 2 minutes. Watch the edge of the pizza while it cooks. Rotate it as needed to avoid burning badly. A bit of char is good. Too much isn't. As soon as the crust starts to go light brown and you see the little black blisters pull the pizza. If the top isn't done your oven is either too hot or there is not enough heat coming down from above. Google refractory heat. It will make sense. 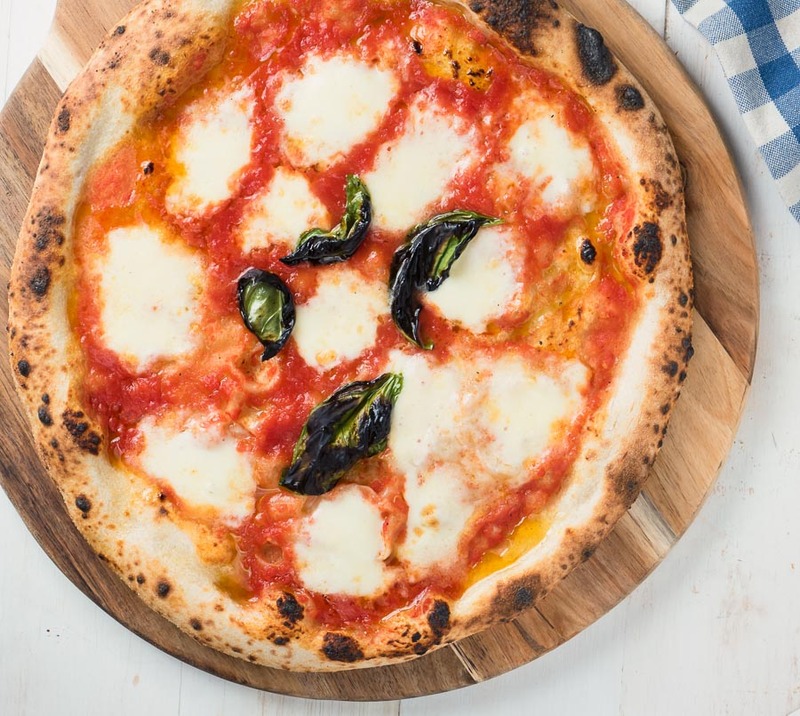 The recipe for Neapolitan pizza dough is here. It's a worthwhile read if you are getting into Neapolitan pizza making. I can eat this kind of pizza everyday. Just perfect. Neapolitan pizza has become a bit of an obsession for me.